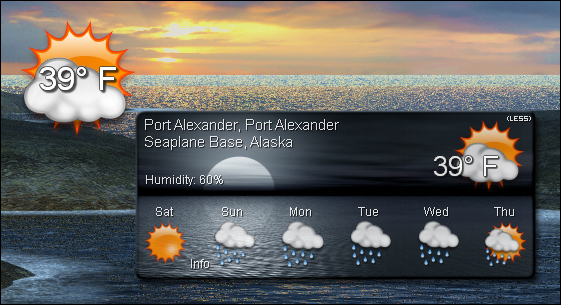 *Did away with the word more on large weather icon(looks cleaner). Click on top part of weather icon to toggle large view & click on bottom part to show large view while hiding small view*..
That's quite......Picturesque, Richard!! Thanks for this! I Really like the look of this weather gadget but ,I have been unsuccessful in getting it to work for my area. Where do you live? This weather script usually does mostly airports by you..If you want to email me at relhom@cox.net I'll send you a different one with different weather script (which they don't allow here). Should work better for your location.. Does zip codes & locations not airports.. Your very welcome, thank you.. Thank you sooooooo much ! !